The Cooperative Extension Service's 4-H Summer Academy focuses on academic excellence and social/emotional development considering the individual needs of the whole child. This six-week enrichment program for enthusiastic learners, ages 5-14, offers a wide range of activities to enhance critical thinking skills, problem solving techniques, and creativity. Our counselors are professional educators with experience at the elementary or junior high levels. 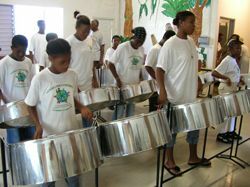 Participants have an opportunity to probe a wide variety of subjects; including visual arts, mathematics, science, reading, language arts, expository writing, and computer science. Additionally, depending upon the program selected and the age-level, they will be able to select activities including field trips and outdoor recreation, nutrition education, clothing construction, personal development, and a youth entrepreneurial program known as Mini-Society . 4-H "Get in the Groove"
Ages 5-7 SUPER KIDS will experience age-appropriate, fun, recreational, educational and motivational experiences. The Super Kids program is built around weekly themes; such as culture, agriculture, science and sea environment, field trips and other special activities. Some of those activities include arts & crafts, sports, science, group play and time in our computer lab. Our dedicated and dynamic super counselor team is ready to welcome your Super Kids to a great summer experience. Ages 8-10 CREATIVE KIDS will become acquainted with how science is used to help campers learn more about events, people and places that make St. Croix a wonderful place to live. The Creative Kids will become young agriculturists as they "dig into dirt', and explore the art and science of agriculture. Creative Kids will become young scientists, engineers and computer gurus. During their six weeks, they will be "up in the air" as they launch rockets, design paper airplanes, and fly homemade kites. They will discover the forces behind natural disasters; and they will also dig deep to discover the science behind substances and engage in wacky and weird science projects. Additionally, they will take field trips, have guest speakers and take part in other special activities. Ages 11-14 SHINING STARS It has happened to you before. You are in the middle of something you love - reading a book, working on a car, building a model, training your dog, stringing beads for jewelry...and the time just flies! Where have the hours gone? Why has time gone so quickly? It is because you are doing something you LOVE to do. Everyone has a passion to succeed and do amazing things in life. In BE THE "E". You will learn a lot about what it takes to be a successful entrepreneur. You will discover new things about yourself. You will make connections that will help you accomplish your goals. You will learn the steps to building a successful business. Most importantly, you will discover your passion and want to pursue it! Ages 11-14 YOUNG SCHOLARS will receive sessions in writing expository prose needed in high school and college. Computer workshops will introduce campers to computers focusing on the internet and word processing techniques as effective tools for publishing. Young scholars will also be able to select from various hands-on activities, such as: nutrition education, crafts and design, personal development, computer technology, cultural wear, and Science Olympiad. Informative guest speakers and educational field trips will also be a part of this group's summer experience. Love It! Plan It! Do It! Ages 5-6 CLOVERBUDS will experience fun, recreational, educational and motivational experiences that are age-appropriate. The Cloverbuds program is built around weekly themes; such as culture (includes traditional manners and etiquette), basic agriculture, sea environment, and other field trips and special activities. Other camp activities include arts & crafts, sports, science, listening to cultural and educational music and stories, group play and some technology time in our computer lab. Our dedicated and dynamic "Clover" counselor team is ready to welcome your Cloverbuds to a great summer experience. Some of those activities include arts & crafts, sports, science, group play and time in our computer lab. Our dedicated and dynamic super counselor team is ready to welcome your Super Kids to a great summer experience. Ages 7-8 CULTURE/AGRICULTURE campers will step back to look forward. They will explore our rich and vibrant island culture and learn more about the events, people and places that make our island a wonderful place to live. 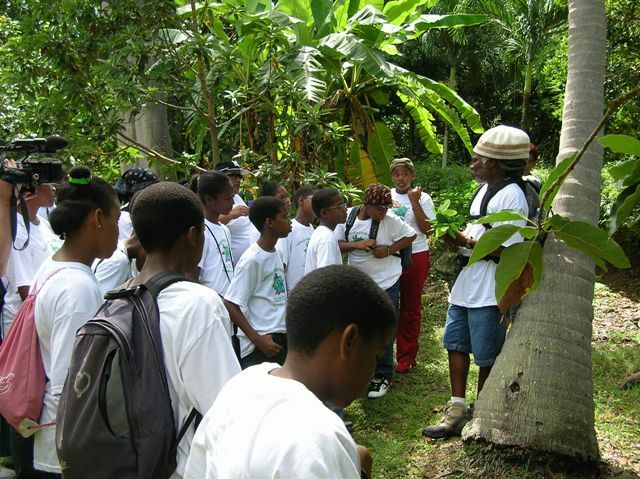 Reflecting on our history as the "bread basket" of the Caribbean, the campers will become young agriculturists as they get down into the soil, and explore the art and science of agriculture, learn about cultural dances, music, history and other cultural trades or crafts. As a basic introduction to local historical and agricultural traditions, they will learn about local plants, trees, insects and their common names, uses or dangers. Recognizing the growing importance of local food production and sustainability in improving the quality of our lives, our culture/agriculture will become young farmers, and cultural bearers. During their six weeks, they will learn about the island's landscape from touring the hills to historical street and area names. Of course, they will also take field trips, have guest speakers, and other special activities. Even a St. John visit is possible so they can learn about its historical sites and cultural significance. Ages 9-10 MINI-SOCIETY/CULTURE will utilize a registered program entitled, Mini-Society that will engage the campers in a-hands-on creative, entrepreneurial venture. The campers will learn vocabulary used by the corporate world, and gain financial knowledge and insight to embark on the creation of their own government leaders, infrastructure, currency, and business. You accomplish your goals, and learn the steps to building a successful business. The goal of this program is to create budding entrepreneurs that will seek to become future business owners. As they learn about and visit different locations and offices, they will meet actual officials and others that make up the government and business world. They will also study various influences and traditional businesses that impact the community and discover how they can become stewards in various areas of publics service including emerging occupations in Cultural-Tourism. A tour of Charlotte Amalie's historic and business district will provide influences, shaping Virgin Islands' culture. They will have a well-rounded experience. Love It! Plan It! Do It! Ages 11-14 SEWING/COOKING will include fun activities for girls and boys. campers will learn how to make two garments plus, other projects using a sewing machine. Patterns, fabric and sewing supplies will be provided. The campers will also learn the art of batik and tie dying. During the cooking part of the camp, the campers will cook nutritious dishes. They will learn kitchen safety and sanitation, nutrition, how to measure ingredients correctly and different methods of food preparation. TECHNOLOGY" Computer workshops will introduce campers to computers focusing on the internet and word processing techniques as effective tools for publishing as well as exposure to other new technology. Help us save paper and ink by viewing our camp details online. For more information, please contact us at our Main Offices!